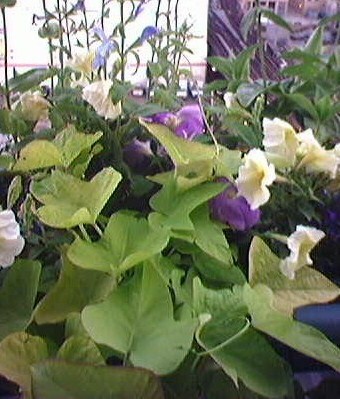 The sweet potato vine with its big heart-shaped leaves is a nice trailing plant for containers. You must remember this: the rules of an in-ground garden don’t necessarily apply to your containers. One of the things I’ve learned from studying O.P.P. (Other People’s Planters) is that you really need to pack the plants in somewhat densely to achieve maximum effect. When I set out my very first flower planter on my balcony some years back I had approximately six small cell packs of marigold spaced over the length of a 36-inch planter.